The Searing Vengeance of... Sunfire! When it comes to Shiro Yoshida, the mutant known as Sunfire, it's difficult at times to be in the man's corner, since a great deal of his time in a comic is spent espousing his nationalist fervor for his island nation of Japan. One could argue, perhaps correctly, that Shiro's abrasive personality toward foreigners is not by choice, having been pulled in two different directions by his uncle and his father--one wishing to return Japan to the height of its power and influence and avenge its defeat that followed the twin atomic blasts of Hiroshima and Nagasaki, while the other constantly chides Shiro for taking such a fanatical view of current affairs and refusing to live in the present. The former, his Uncle Tomo, discovering his nephew was a mutant, sought to use his influence to fan the flames of hatred in Shiro and thus be able to direct the power of Sunfire however he wished--while Shiro's stern father, Saburo, refused to allow his son to become so obsessed with Tomo's enmity toward those that brought Japan to its defeat in the war. If Tomo and Saburo ever had these outbursts with each other, those scenes never became part of this initial story; but it was clear their tug of war with Shiro was taking its toll on him, since it was becoming evident that Shiro was becoming more aligned with his uncle's views every day. Created by Roy Thomas and Don Heck, Sunfire--his powers to emit bursts of intense heat a result of his mother being located a number of miles from the center of the Hiroshima blast--arrived in comics in 1970 when the world's population of mutants was still sparse enough that his debut appearance in X-Men could be an impressive one. 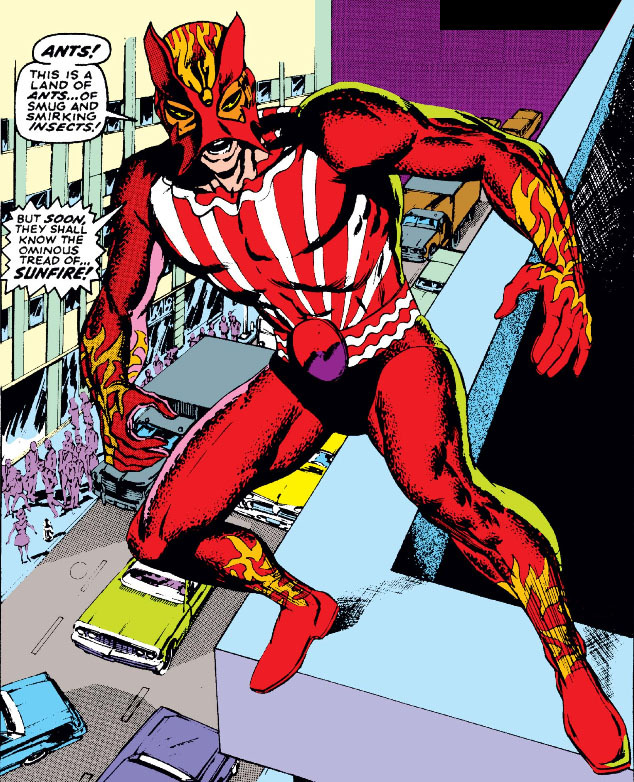 That assessment may be due in large part to his distinctive costume, which is arguably one of the finest designs in Marvel's extensive costume gallery and remains so nearly fifty years later. 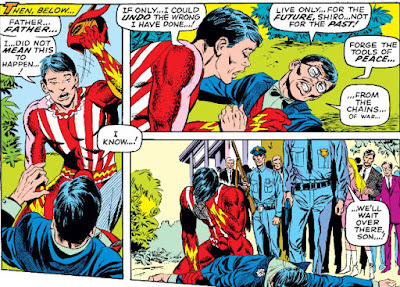 Accompanying his father, a U.N. delegate, to New York, Sunfire appears and destroys a new monument that Saburo dedicates to honor both peace and the youth of the world. 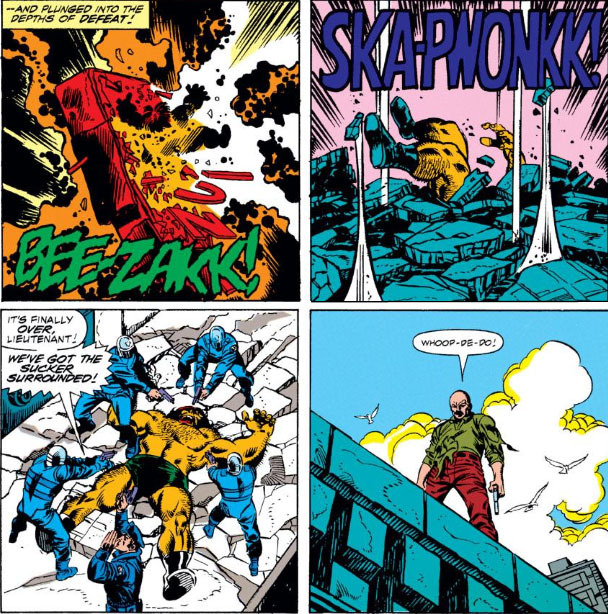 Three of the X-Men--the Beast, the Iceman, and the Angel--are witness to the destruction and attempt to corral Sunfire, only to fail. Yet Sunfire's true goal lies in Washington, D.C., the Yoshidas' next stop, where Saburo is scheduled to give a speech before Congress, with the dome of the Capitol building representing a symbolic target of Sunfire's (or shall we say Tomo's) ire. But as Tomo is prepping his nephew for the task that awaits, their conversation is overheard--and Saburo at last learns that it's his nephew who has been carrying out the recent attacks in the States. 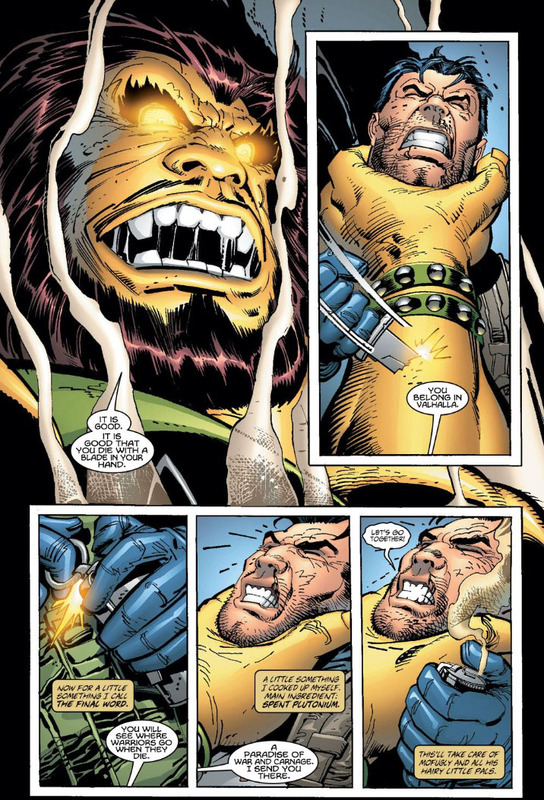 Once again, the X-Men engage Sunfire--but at the battle's pinnacle, Saburo gives his son an ultimatum, with tragic results. You would think Saburo's last words to his son, and the circumstances of his untimely death, would have had a lasting impact on Shiro--yet though he murdered Tomo in turn, Shiro would continue to embrace his uncle's fanatical dreams of Japanese supremacy for some time. And after he's presumably deported following his activities in Washington, Shiro ends up in Tokyo, where his path crosses with another who holds even more extreme views than Tomo, and who is able to subvert the vulnerable Sunfire to his cause. This Is A Job For--Betty Dean! 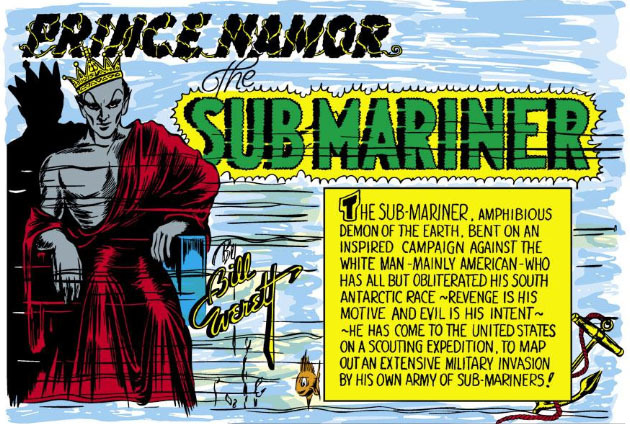 Anyone familiar with the history of the Sub-Mariner no doubt recalls the character of Betty Dean, a police officer who was assigned to trap Namor by posing as a drowning swimmer in order to hopefully provoke him into "saving" her. Betty dates back to early 1940, during the time when Namor was making a series of attacks on New York while the German war machine was moving through Europe. 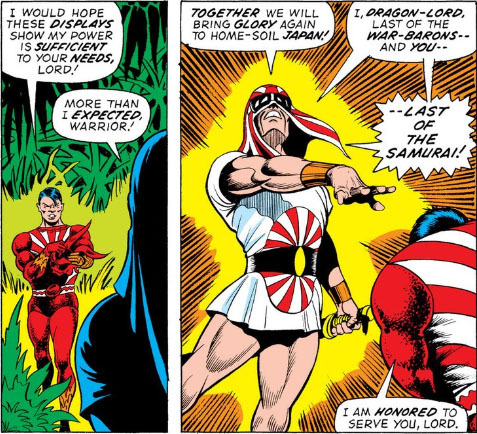 Namor's reasons for engaging in hostilities toward the U.S. eastern seaboard were in response to the casualties inflicted on his people due to American incursions near his home; yet even though the U.S. was still two years from entering the war, the war itself would end up being a backdrop to the meeting between Namor and Betty, and would play a crucial role in easing tensions between Namor and America and pivoting him toward battling the Nazis and their allies. My first exposure to the story of Betty Dean happened to take place in my first exposure to Marvel comics--with Sub-Mariner #38, an issue where Namor was in grief over the loss of the lady Dorma and was sifting through his memories of both Atlantis and loves lost. 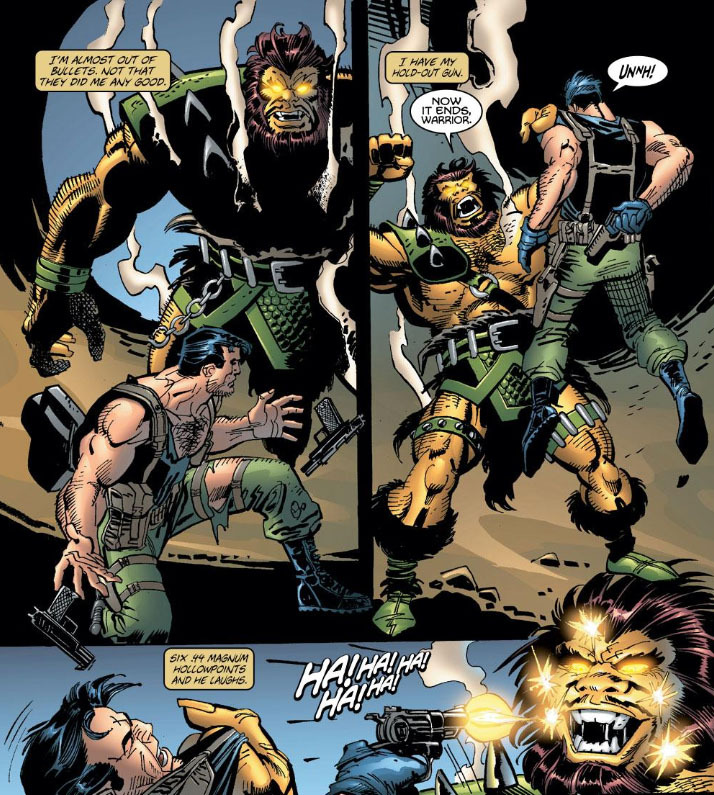 Written by Roy Thomas, the scene where Namor meets Betty is encapsulated by Thomas to cover the basics, though clearly omitting a good deal of context. The story of Betty's introduction adds an air of romance to a menacing character who up to that point was little more than a misguided marauder. And a good thing, too, since much more rides on the romantic angle in that story than any hope of success in the police department's "plan." Did Betty's superiors really send her in hoping that her deception would result in an arrest? The police must have fought any number of prior engagements with Namor and realized that their bullets were ineffective--what hope did Betty have brandishing a pistol? And how was that purse supposed to keep her gun from being clogged by sea water? "All right, Mr. Sub-Mariner, you asked for it! *CLICK* Oops..."
Thomas had also made a point to introduce Betty in an earlier story of the new Sub-Mariner title--yet while he's obviously aware of many elements from the 1940 story, he curiously alters the circumstances of their meeting completely. 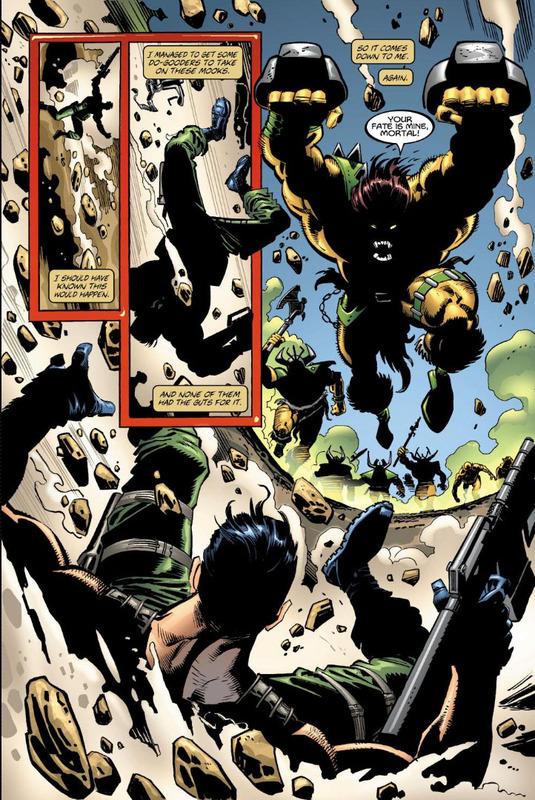 Namor's memories in that story center around locating and securing the so-called helmet of power used by his now-deceased foe, the man called Destiny. But through his recollections, we also learn that his relationship with Betty was a platonic one--mainly because of a reason that amounts to "hogwash," given his intentions toward Sue Storm and, later, Marrina. But Namor's thoughts of Betty have a deeper purpose in Thomas's story since they lead to his reunion with Betty 28 years after their first encounter, during a scene where Namor is involved in a fight with the Thing to recover Paul Destine's helmet. 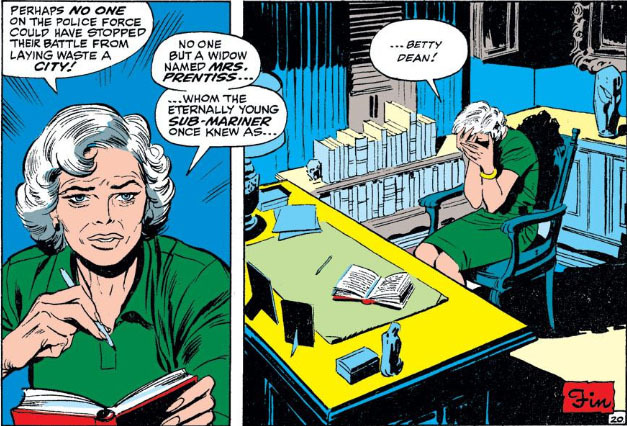 Given the way in which that meeting takes place, it's possible that Thomas altered the details of Betty's first appearance in order to given the newer scene a sense of symmetry, in terms of Betty ending the conflict as well as Namor's abrupt departure. The complete story of Betty Dean's first meeting with Namor, in Timely's Marvel Mystery Comics, takes us back to a much simpler time in storytelling, with the events of the war being felt in American comic books in tales of sabotage and intrigue. Legendary Sub-Mariner creator Bill Everett was all of 22 years old when he produced the story, marking the point when the Sub-Mariner takes his first steps toward becoming a hero to those he had previously attacked in earnest--and all because of a police officer who met him as a brash foe but would go on to become one of his most trusted friends. The Death Of The No-Prize! In mid-1982, Marvel increased its stable of book editors to six by adding Mark Gruenwald to its editorial staff and assigning him to oversee half a dozen titles, beginning a long tenure at the post that would last six years (at which time he would be promoted to Executive Editor). By most accounts, Gruenwald's run as Editor was a distinguished one, having his share of controversial decisions during a tumultuous period in Marvel's growth. I'm not sure of how many book editors Marvel ended up with during this time; six books per Editor seems like a reasonable load for any given person, but six editors sounds like too many decision-makers for a company that was still making the attempt to blend all of its books and characters under the Marvel banner and give the appearance of a unified direction and vision. The day-to-day, week-to-week process of getting all of these editors on the same page, as it were, must have been a fascinating one, particularly in cases where sweeping changes are made by any one editor that must take the titles of the other editors into account. The ground we're about to cover is no doubt little more than a hiccup in terms of policy, but serves as a good example of what one editor can put in motion that might have a rippling effect on Marvel's entire line--or more to the point, Marvel's unique relationship with its readership that had been carefully cultivated for over two decades. 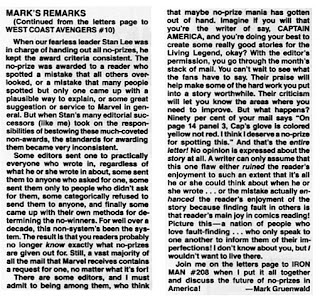 Four years after assuming his new duties, Gruenwald began a series of essays in monthly letters pages entitled "Mark's Remarks," which covered a number of interesting behind-the-scenes subjects in an effort to engage with his books' readers and make the letters pages a more robust forum. * In one such column that, in its entirety, would end up taking a full page, Gruenwald took to task the long-standing practice of awarding the "no-prize"--the nonexistent virtual reward that was given to a reader as a sort of gold star for their effort or observation made in a letter to the editor. 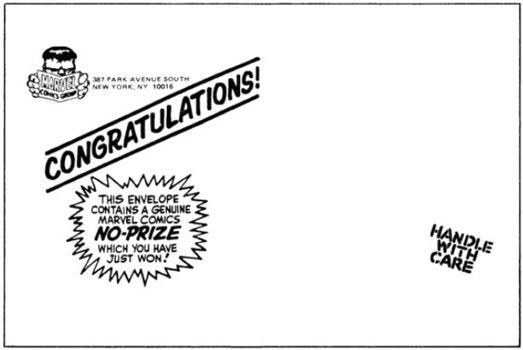 As Gruenwald explains, over time the no-prize, despite not being an actual prize at all, nevertheless took on a life of its own. Of all the things for an editor to take issue with, it's hard to imagine focusing on a concept that has no real meaning or substance, one that basically boils down to a simple acknowledgment that singles out a reader to congratulate. 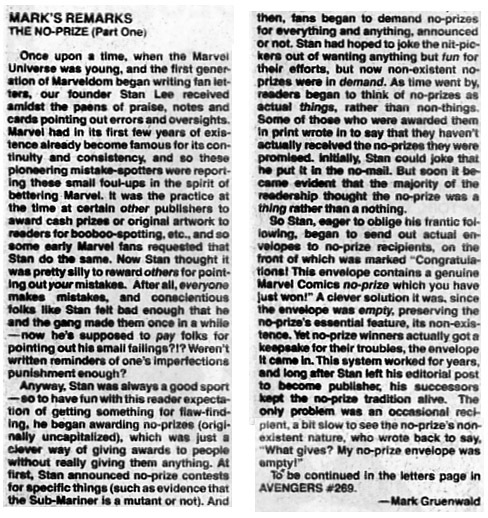 Though in all fairness to Gruenwald, it's astonishing to think that the concept of a non-prize (to more clearly categorize it) could escalate to the point where it's causing headaches for letters handlers and rubbing editors the wrong way. 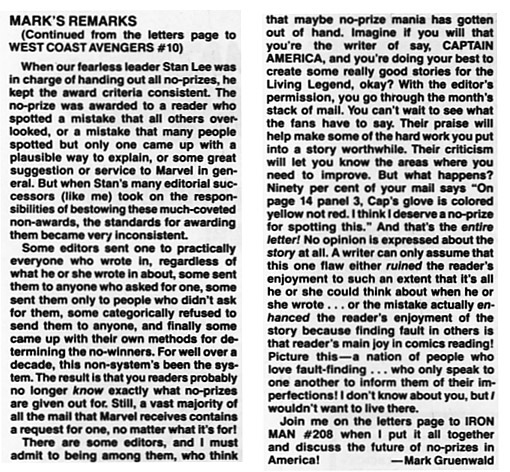 Gruenwald covers the matter well, making a number of valid points... but his solution is perhaps overkill, sacrificing what had become a clever device for engaging the company's customer base and relegating it to a blurb on (appropriately) a letters page--a few final words that essentially let readers know, however eloquently, that Marvel was through being pestered by this holdover from the days of Stan Lee, and that the "no-prize" had been abolished for good. Yet it's a "have your cake and eat it too" moment for Gruenwald, for two reasons: first, of course, he's abolished nothing, since there was really no system of doling out actual prizes to discontinue. But secondly, the no-prize had now been rendered automatic, and arbitrary--anyone, at any time, could be no-prized, whenever they felt so deserving, or even when then didn't. 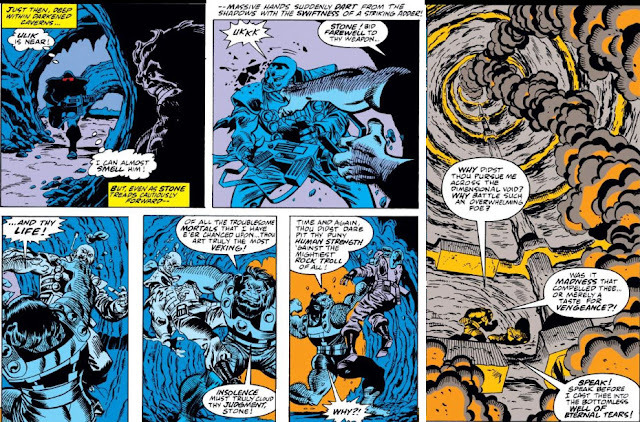 But in making the desire for a no-prize meaningless, Marvel had severed a time-honored lifeline to good relations with its customer base, one of the few practices left from Marvel's many changes over the years (along with the letters pages themselves) that sustained our nostalgia for the company. 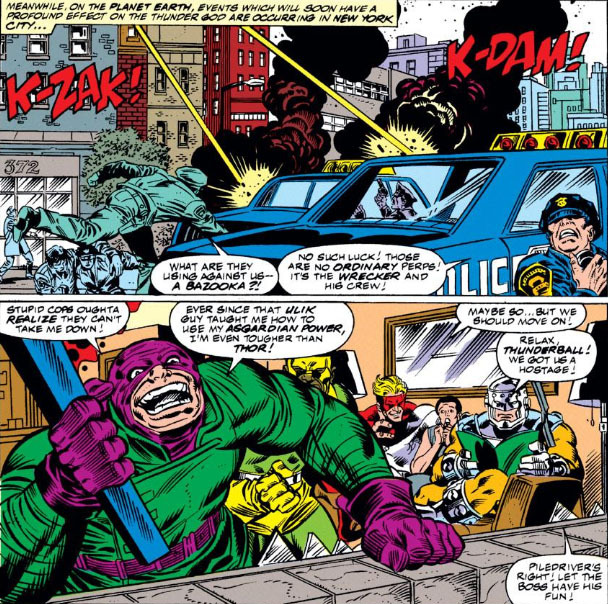 However frivolous the practice might have been, it was a fun by-product of the connection readers made with Marvel's writers and editors, and vice versa. As for the Letter of the Month policy that was substituted in its place, it might have been a rare occasion when a recipient of that honor saw the light of day. 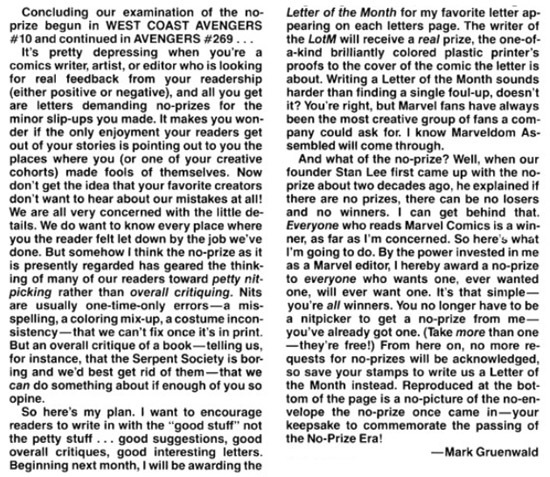 In fact, the only one I recall was a tongue-in-cheek award given to a reader whose letter raised a few questions with Gruenwald, including one that asked why no Letter Of The Month was being mentioned on any letters pages since Gruenwald's announcement. Rather than a substantive answer, the response punted to readers: "We've been awarding them, pal--but we've been remiss in printing the names of recipients. How about it, readers--you want us to print our L.O.M. winners every month without fail?" I only glanced through about 18 issues' worth of letters pages from that point--but either readers were mum on the subject, or the Letter Of The Month concept was something never put into practice, instead meant only to generate interest in more thoughtful letters. Otherwise, consider the cost, time, and material that would be involved for Marvel every month: One prize per letters page every month of the year, following a decision-making process that selects one letter from each title's stack of mail. Assuming Gruenwald's edict is across the board for Marvel's full line of titles, that would result in roughly 40 mailings of plastic printer's cover proofs every month of every year--presumably sent in flat envelopes that had to be purchased and stocked, and Marvel eats the shipping cost as well. In other words, will all of you award winners raise your hand? Oh for the days when this showed up in your mailbox! At Death Do We Part! If you were a regular reader of the first run of the Mighty Thor book, you may have eventually reached a point where you didn't give much thought to news of another Thor vs. Loki issue, since their long quarrel had driven them to blows more often than any of us would care to count. But for the sake of argument, the PPC has made a rough count on your behalf, and rounded off their clashes to 24 by the time the title's 432nd issue was published, an issue which billed yet another head to head conflict between the two. That two-dozen count is admittedly a bit on the conservative side, since the tally doesn't take into account any meetings in The Avengers or other titles beyond their match-ups in Thor and Journey Into Mystery. 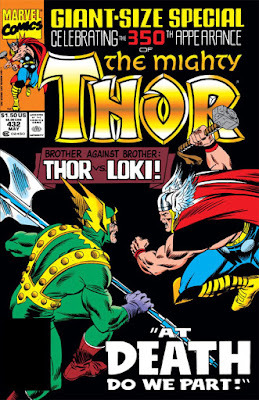 But since issue #432 marks an anniversary of sorts--the 350th appearance of Thor since his debut in JIM #83--the most recent battle between Thor and Loki has been given prominent cover exposure as well as an oversized issue in which to play out, which implies that we may not be seeing the usual fare this time around when it comes to "Thor vs. Loki," that this time will be different. And that would certainly make for a welcome change. In the past, their meetings have amounted to variations on a theme: (a) Loki's plans are defeated, (b) Loki is fought and captured, (c) Loki is called on the carpet by Odin, and (d) Loki is banished, exiled, imprisoned, or otherwise dealt with for the time being. 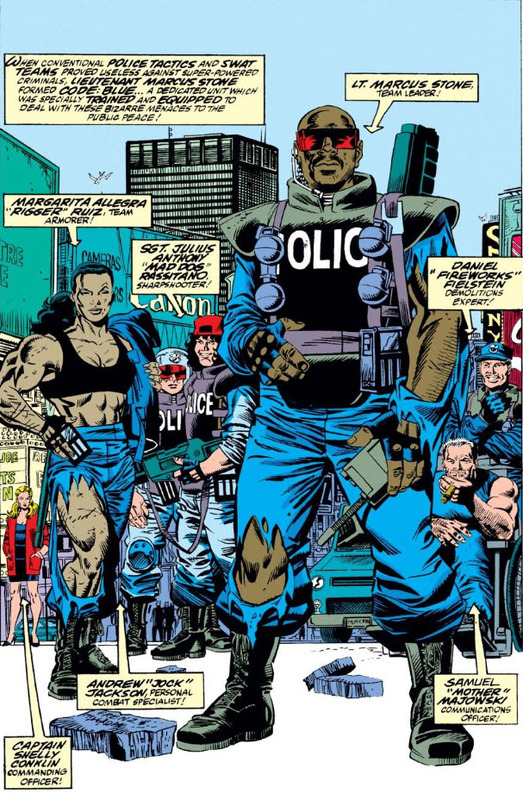 In this issue, their legendary conflict has come to a head following Loki's recent machinations that would allow him to reclaim the surplus power long ago stolen from him by the villain known as the Wrecker--power which was in turn dispensed to three fellow convicts that, together with the Wrecker, formed the Wrecking Crew. Having now rendered those four powerless and drawn that power to himself, Loki is now able to meet Thor in deadly armed conflict, but still having an edge in his additional powers of sorcery. That covers the specifics of how Loki will withstand and perhaps even surpass the strength and power of his brother; yet the issue's story will also put on display the differences between these two which span an immortal lifetime of slights, jealousy, bitterness, and poor choices that have helped to make Loki the "god of mischief" in the minds of the Asgardians and even his own step-family. And if he has also gone on to be known as the god of evil, it's unfortunately an appellation well deserved. At this point in time, Thor is merged with the mortal Eric Masterson, an architect and single father with a young son. 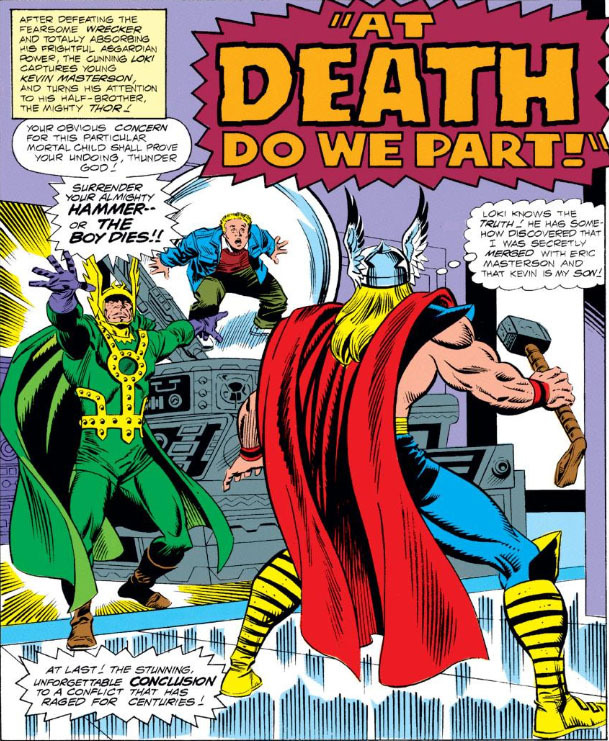 The story's splash page brings us up to speed on where things stand--but it's obvious that Loki has planned well to have Thor at his mercy, given the helpless young hostage whose fate he taunts his half-brother with. We've got thirty pages to go, so we can likely assume that Thor manages to think his way out of this immediate predicament. But make no mistake: by the time the story reaches its end, one of these three people will die. "This Is A Double-Zero Priority--Code: Blue!" The concept of Code: Blue is one that could easily have sprung from the mind of Jack Kirby: A collection of crusty men and women thrust into extraordinary circumstances by their line of work and relying on their grit, determination, and overall cockiness to see them through--a diverse group of unsung heroes who came in and did the job, no questions asked, having no powers or advantages in battle other than their quick thinking and fighting heart. 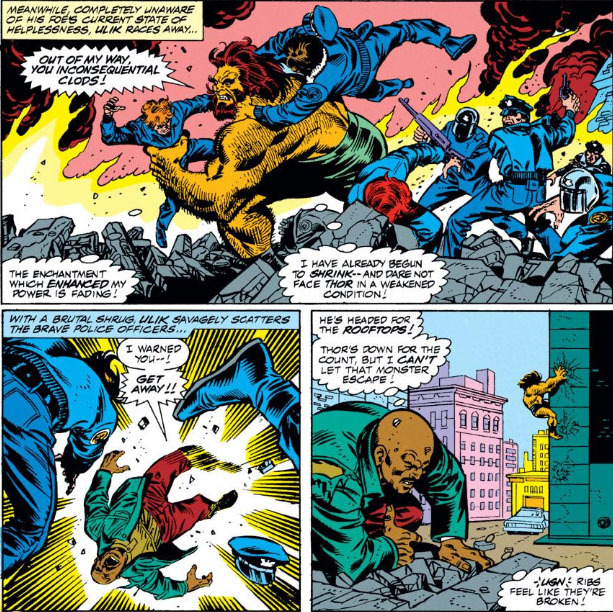 Code: Blue was conceived and created by Tom DeFalco and Ron Frenz, but you could almost swear it was Kirby's words coming from the characters' mouths, so closely do the wisecracks and general back-and-forth of the dialog mirror his style of writing. DeFalco, in perhaps a tip of the hat to Kirby, even at times places emphasis on the wrong words in their speech, presumably in an attempt to inject a sense of personality into the character(s)--a scripting quirk which drove me absolutely nuts when reading one of Kirby's stories and which DeFalco brings to Code: Blue to a certain degree. Code: Blue is led by Lt. Marc Stone, who had already made his mark in carrying out his duty for the N.Y.P.D. 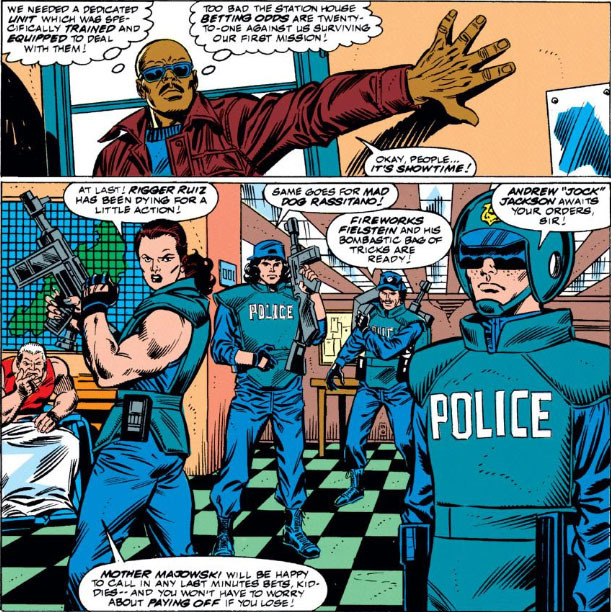 and, from his experiences in the field, has seen the need for a special SWAT unit to be established for dealing with super-villains. 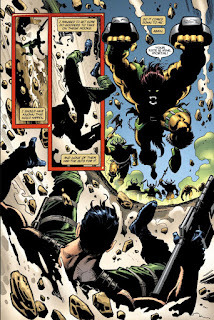 To what end isn't really clear--even Stone was unsure at the time that such a unit would be able to cope with the level of threat that a super-powered villain posed. 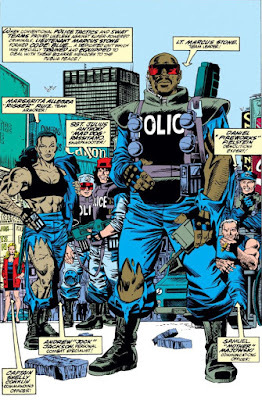 Code: Blue seems to function best by taking the heat off of the super-hero(es) already on the scene; but also working in their favor is that whatever villain they're facing is usually in the habit of underestimating them, which gives the unit a small window to play on that disbelief and accomplish their mission. If nothing else, you have to give Stone and his team props for suiting up and bringing both confidence and skills to whatever situation they're ordered to deal with, whatever the odds against them. And what Code: Blue brings to the table isn't insubstantial by any means, just as is the case with any SWAT team; it's just difficult at times to see what sets them apart. From their early encounters, they would appear to have no special training outside of that received by their peers; they have no Stark-designed weaponry; they've studied no dossiers of known, at-large villains; nor are they specially prepared to encounter super-powers. Rather, they seem to simply go in and adjust their tactics on the fly, depending on the details they get when the zero-zero call (alleged super-criminal activity) comes in. So what makes standard SWAT teams fall below the par of Code: Blue? Whatever distinguishes Stone's unit will have to be seen on the job. And so as they're presented to us, Code: Blue might remind you of a line from the 1965 film In Harm's Way, when Adm. Tory asks Col. Gregory if his para-marines are in shape for a parachute drop: "Maybe they're a little bit rusty, sir, but they're eager as hell!" It's an impression that Stone will have to take to heart, since their baptism of fire is at hand. Come on, this team just reeks of Kirby! Paws Up, Troll--You're Under Arrest! It isn't often when the mortal characters in comics can hold their own, or even manage to survive, when facing the super-villains who couldn't care less about causing collateral damage (human or otherwise) when battling the hero(es) they face. If the bystander is lucky, they're able to escape the carnage--or perhaps the hero on the scene is able to save them from meeting an untimely death. But there are others who aren't content to be bystanders, and instead take a more active role in a conflict where lives are in danger--such as Wyatt Wingfoot, or Eric Masterson, or Rick Jones, or certainly those on the police force whose duty and dedication puts them in harm's way. One officer who excels in both duty and dedication is Lt. Marc Stone, who went on to propose and lead the Code: Blue special ops unit of the force but whose commitment to collaring criminals had already made him a respected police detective, whose job always came first. But a year before he would form the group that would pit himself and those he led against the some of the fiercest super-villains in New York, Stone was reordering his priorities in order to appease his wife's wish that he leave his dangerous job. Is Lt. Stone the type of man to walk away from the force? For a man who values commitment in doing what's right and what's necessary--a man who also made that commitment to his family--it would seem so. 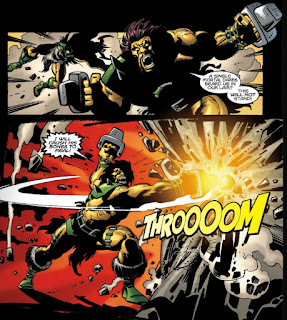 Yet the true turning point for Stone comes when Ulik, the fierce rock troll who has challenged Thor on many occasions, is loose on the streets after a battle with the Thunder God that forced him to withdraw, leaving the police on the scene to try to contain him. It's no surprise that Ulik is too much for any mortal force to deal with--but one mortal is determined to try, and, more than that, determined to succeed. 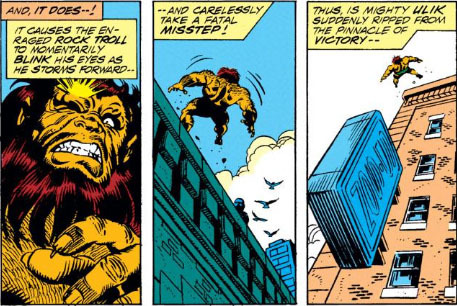 It was the first improbable contest between Stone and Ulik--a heroic feather in Stone's cap, though clearly Stone's thoughts are focused on what his wife's reaction will be to his resignation forms being hurled to the wind. Yet apparently the clash between these two struck such a chord with writer Tom DeFalco that he followed up with the pair three years later, when Stone led Code: Blue to Asgard itself in response to a member of his team being injured during Ulik's escape from custody. 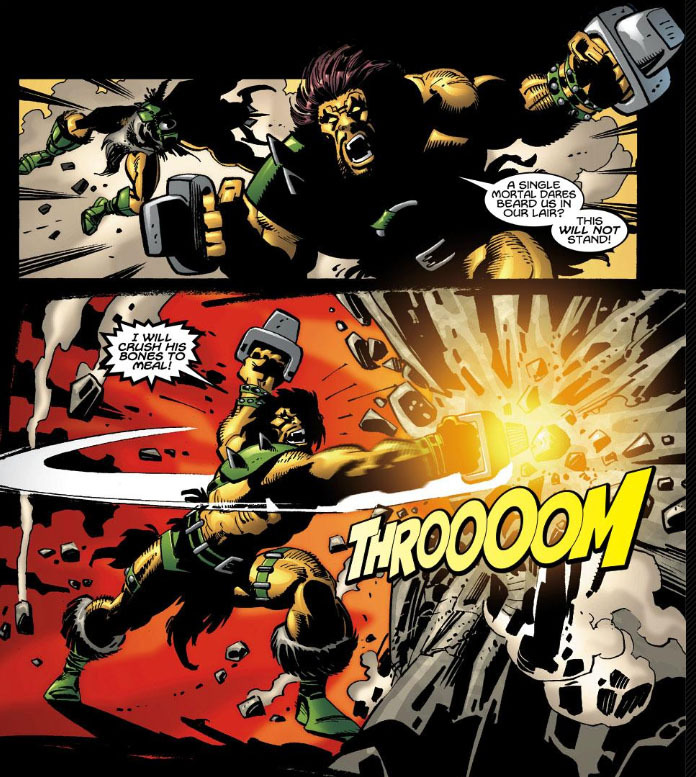 When the team locates Ulik and the assault begins, Stone is separated from the rest of the unit--but to no one's surprise (and certainly not the reader's), he presses on by himself. 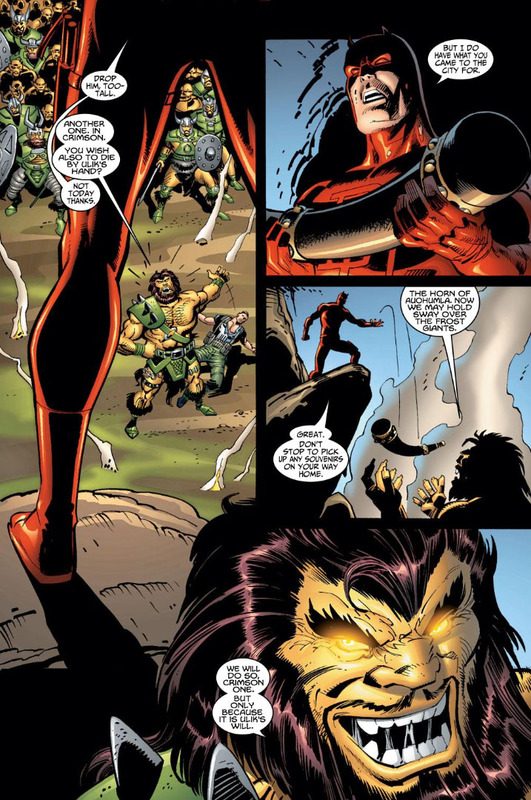 By this point, there is enough history between Ulik and Stone that Ulik now feels enmity for his mortal pursuer, though it contrasts with Stone's single-minded goal of recapturing this "criminal" and not allowing him to get away scot-free in light of the callous injuries he's inflicted. The only thing they share in common as a result is their intent to prevail--which, along with the overwhelming advantage one of these combatants has over the other, makes this struggle a riveting one. In the end, it's hard to tell which of these two exhibits the most tenacity. Stone would have no choice here but to resolve himself to the fact that his "suspect" got away--though no one could argue that he didn't acquit himself with distinction. Thanks to alert reader M.P., who had pointed out Ulik's clash with another mortal gunning for him, let's take a quick look at a Marvel Knights story from 2000, where we find Daredevil and the Punisher dealing with a group of trolls (led by Ulik) who are trying to recover an Asgardian artifact by bringing down the New York building where it's being held. 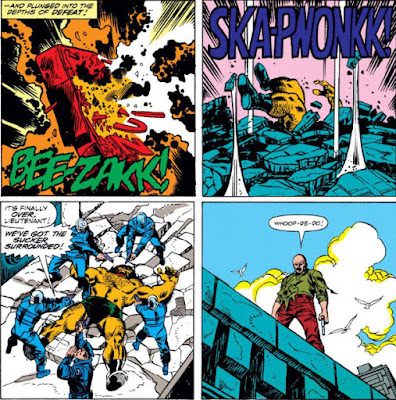 Apparently the suits upstairs aren't keen on parting with it, even with their building crumbling all about them--and so Daredevil heads off to convince them, while the Punisher assesses the threat of his targets, as only he can. 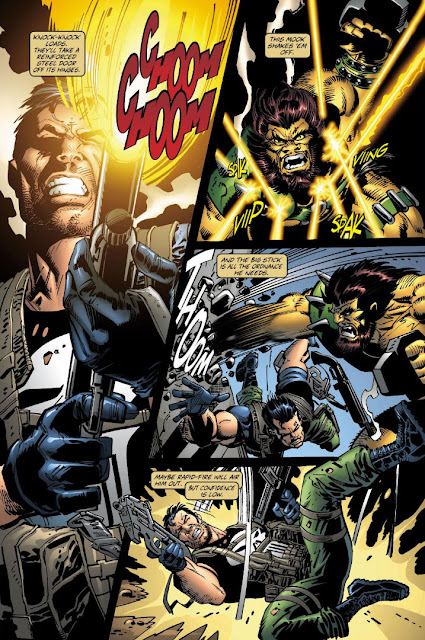 It stands to reason that the Punisher has similar experience to Stone's when it comes to weaponry and tactics, and he's probably packing a good deal of heat and ammo to spare, though the Punisher of course has no interest in 'cuffing Ulik and taking him in--quite the opposite. 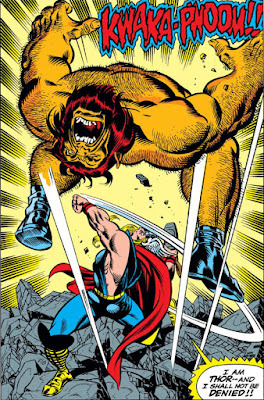 But can the Punisher's methods of "punishment" inflict the damage on Ulik that the hammer of Thor is capable of? Probably not, but it isn't for lack of trying. It's safe to say that the writing is on the wall as far as the Punisher's chances of pulling this one out. He's running out of options, out of ammo, and out of time. But you know Frank Castle--if he's going down, he's going to take the Punisher with him. Again, probably not. 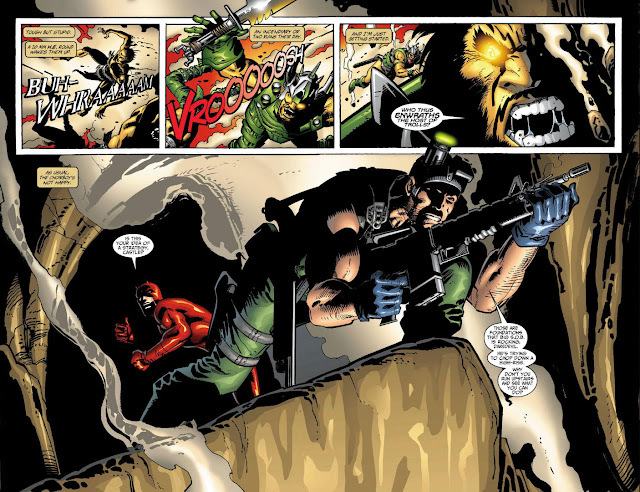 Fortunately, Daredevil's time has been productive, and the Punisher will live to fight another day, though with Ulik's gloating words ringing in his ears. But that's better than a detonation at point-blank range. 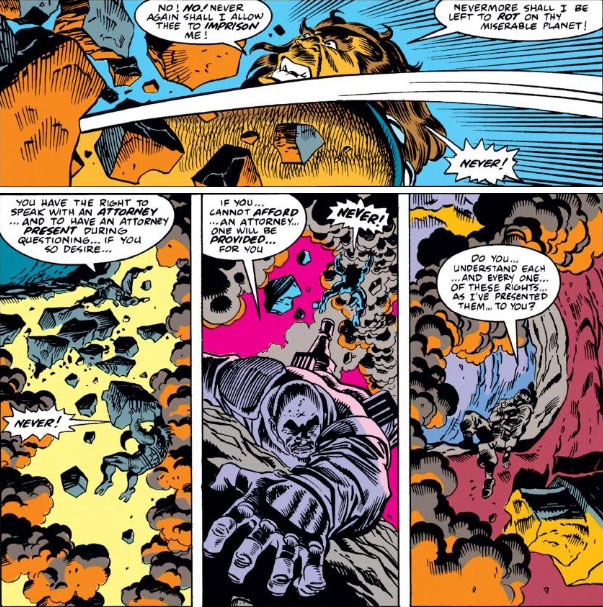 Lt. Stone's clash with Ulik offers an opportunity to size up two full-page KA-POWs between artists John Buscema and Ron Frenz--the latter artist appearing to swipe pay homage to the former's style, though in his Thor work Frenz clearly made the rounds with other artists in that respect. Whose chin had the sorest bruise here--Thor, or Ulik? The debut of Code: Blue! Will they make a difference? Will they spin off to their own comic? At The Command of The Leader! The Avengers vs. The U-Foes vs. The Avengers! "Run! Run For Your Lives!" The Monster From Beneath Us! The Patriot And The Punisher!